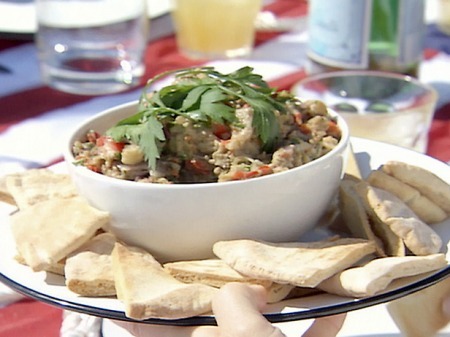 I’m always looking for an easy, healthy, recipe that don’t skimp on flavor, so when I saw this recipe for a Roasted Eggplant Spread on Ina Garten’s show, Barefoot Contessa, I was sold. The title is a little misleading though, as I find that the peppers and tomato paste are just as important here as the eggplant. This entry was posted on October 4, 2010 at 5:42 pm and is filed under Cooking, Family, Friends, People, Random, Recipe. You can follow any responses to this entry through the RSS 2.0 feed. You can leave a response, or trackback from your own site. Sounds wonderful! I don’t usually read recipes unless the title appeals to me, soooo…..
Licking my lips! I am hungry right now after working hard on a post about Adam and Eve. I want some of the dip now. I love eggplant, red peppers, and tomato, so I know it has to be delicious. Caramelizing makes vegetables really flavorful and sweet! This recipe is simple enough even for ME! Ha! Thank you for sharing. Looks and sounds deliciously sublime!